T3 tweeted -"[Oh] yeah one more thing... This is the last Slum Village album." Not sure what's going on," responded fellow member Elzhi. "I hope Slum Village's label and T3's manager respect what I do for SV. Either way I appreciate y'all support." 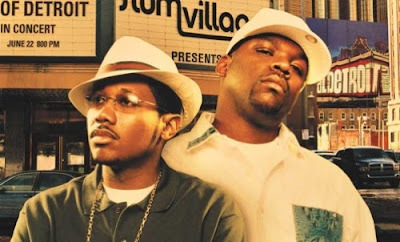 It’s been a rough road for the members of the Detroit rap group Slum Village. With two of the original members, J. Dilla & Baatin, now deceased, the group soldiered on with original member T3 continuing on with new member Elzhi. However it seems that it’s all come to a grinding halt with Hex Murda, Elzhi’s manager, confirming to XXL that Elzhi is no longer with the group, and that the group’s forthcoming Villa Manifesto, which brought Baatin back to the group and featured beats from J Dilla, would be its last. The group lost it’s producer and MC, J. Dilla, in 2006 due to complications from lupus. Another original member, Baatin, died in 2009. Villa Manifesto is due out on July 27th. Come check out THA HIjAQ Volume 1 a mixtape dedicated to real Hip Hop and group's like Slum V and producer's like Dilla and 9th.